Though it is not very popular, calculations of exposure in terms of exposure value - EV, in photography is simplified method, in form of number, which is easy to calculate exposure for tonal value of a photograph. Let us understand, how it works. Let us assume that we are getting a shutter speed of 1/125 of a second at aperture f-5.6 (in given lighting condition and at certain ISO setting) to get a correct exposure, then even if this combination is changed to shutter speed of 1/60 of a second and aperture f-8, we will get the same exposure and tonal value. There are other combinations of shutter speed and aperture, which will work the same way for the same exposure and tonal value. However, these combinations of shutter speed and aperture becomes complicated to calculate, when we have to find contrast ratio. EV is a simple arithmetical whole number assigned to certain exposure combination and in that case, it remains the same for all other combinations, means that if we increase the shutter speed, we decrease the aperture, and the EV number remains constant. For 100 ISO film, EV 0 (zero) is assigned to shutter speed of one second and aperture f-1. Now if we are getting EV 0 on our exposure meter, then we can shoot at this combination or if we change the aperture to f-4, which is four stop less compared to f-1 and then compensate with increased shutter speed to 8 seconds. Each number on EV scale is a difference of one f-stop. So EV 12 is 12 f-stop more than EV 0. Again, let us assume that we are getting EV 12 reading on exposure meter. So in this case we have to reduce the shutter speed and / or reduce the aperture by 12 f-stop and we can do it in any proportion and combination of shutter speed and aperture till the arithmetical total of 12 is achieved. In this example, if we reduce shutter speed to 4 f-stop, we will have to reduce aperture to 8 f-stop and we will get shutter speed 15 and aperture f-16. 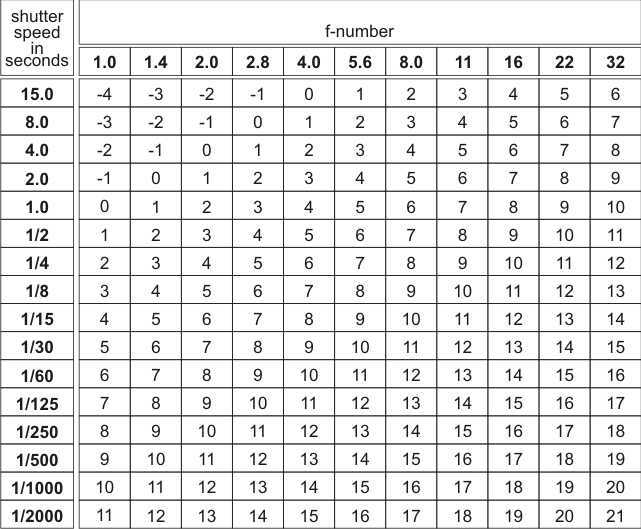 Below is the table for EV numbers for equivalent shutter speeds and f-numbers for 100 ISO. Note: If ISO value is changed, EV number (exposure value) will also change. This is how exposure value - EV number works, and when we take exposure readings in terms of EV number, then we can easily compare high light and shadow area readings to check how much contrast we are getting.